My Sig Riser 100, almost ready to cover. Here are some more photos of airplanes. 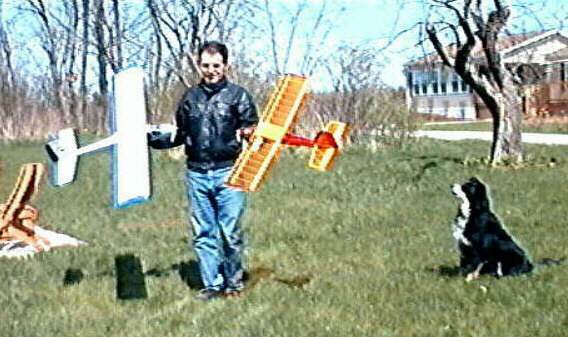 Two of these are planes I’d built this winter. First up is my Sig Riser 100. 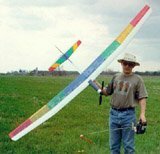 I’d always wanted a 100-inch (2.5m) electric sailplane, and my local hobby shop (Flite Craft, in Kitchener, Ontario, Canada) had a Riser 100 kit on sale, so I bought it. I built it over the course of the 1997/98 winter, modifying it for electric power. I had to stand on a chair in the hallway outside of my workshop just to fit the whole plane into the picture. I recently (early April) completed the plane. Covering completed and ready to fly. The covering is transparent blue, transparent green, and white Monokote, along with a bit of transparent red and transparent yellow Solarfilm. 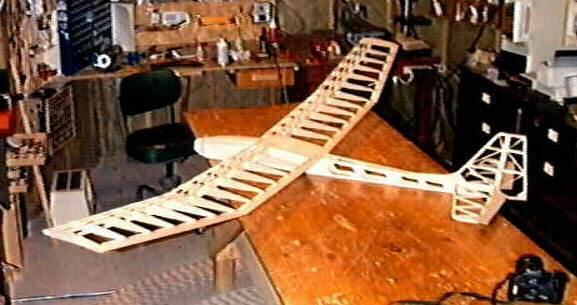 The finished plane weighs 66 oz (1.87kg), and has a wing loading of 9.5 oz/sq.ft (29g/dm2). The drive system is a Kyosho Magnetic Mayhem Reverse, powered by 7x1400SCR or 8x1000SCR, turning a 15×12 folding propeller through a Master Airscrew 3.5:1 gearbox. I’m using a home-made electronic speed control with a brake. 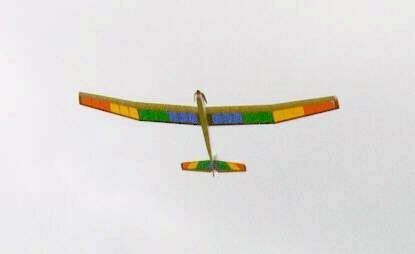 On May 3rd, I took the Riser out for its first flight. The first flight lasted about 20 to 25 minutes. The plane flew perfectly. It’s a little bit more sluggish to respond than a 2m glider, but that is to be expected. Climb is quite good. This is my first experience with a statically stalled prop (15×12), and you can really tell that the thrust picks up once it gets up to speed. The rainbow colour scheme is really beautiful in the air. The other plane I built last winter is one I call the Sydney’s Special. 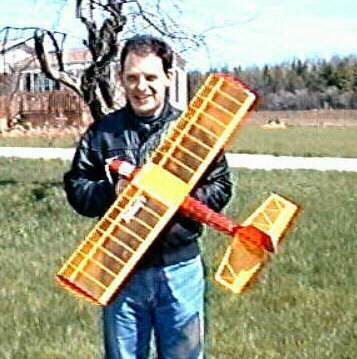 I had previously (two years earlier) built a Fred’s Special, designed by Vernon Williams, and published in the April 1991 issue of Model Airplane News. 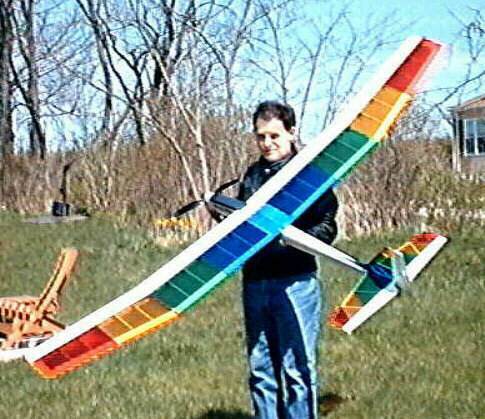 This is a 46.5 inch (1.2m) 05-sized sport plane. I had wanted to build a Speed 400 powered plane, and since I was so pleased with the characteristics of the Fred’s Special, I decided to scale it down to 80% of its original size, and call it the Sydney’s Special. The Sydney’s Special, an 80% scale Fred’s Special. The wingspan is 37 inches (94cm), and ready-to-fly weight is 18.5 oz (524g), with a wing loading 9.9 oz/sq.ft (30g/dm2). The drive system is Graupner Speed 400 6V motor, powered by 7x600AA, turning a 6×3 folding propeller. The covering is transparent red and transparent yellow Solarfilm. The lettering on the wing says “Sydney’s”, which I’d won in a contest held by Vinyl Graphics by Greg. I’ve since ordered the word “Special” for the other wing. I’m very pleased the way this plane turned out. My Fred’s Special was extremely heavy (51 oz, or 1.44kg), due to poor wood selection (I didn’t weigh my wood at the time, but one of the leftover sheets from that project turned out to be 23 lb/cu.ft!). With the Sydney’s Special, I didn’t use any wood over 10 lb/cu.ft, went easy on the epoxy, used micro-servos, and my home-made speed control with BEC. I had expected an all-up weight of around 24 oz, so I was very pleased to achieve 18.5 oz. Fred’s Special, Sydney’s Special, and Sydney. I’ve flown the plane once so far. 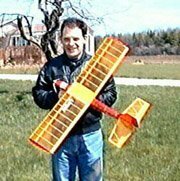 Conditions were very gusty, and I probably shouldn’t have flown, but it flew quite well, and I got it down in one piece. The Fred’s Special was named after Mr. Williams’ dog Fred (who appears to be an Australian Shepherd from the photos in M.A.N). I happen to have a slightly smaller Australian Shepherd named Sydney, so that’s why my scaled down version is called Sydney’s Special. Here’s a photo comparing the Fred’s Special and Sydney’s Special, with Sydney anxiously waiting for me to toss both of them into the air. Most of my 1998 fleet. Finally, here’s a partial fleet photo. My Spectra-V is missing, only because I didn’t bother to bring it out for the photo session. It’s still intact, and I flew it on a warm day in February. Thank you for taking the time to compile this information- it was all clear, useful, and well written!